The monsoon season is here and so is the beginning of monsoon travel. While many of you prefer watching and dealing with the rains from the windows of your house, there are many, like us, who enjoy getting wet in the rain and exploring the hidden gems of nature uncovered by the rains. While the entire country turns into a beautiful haven to stroll about during the rains, the state of Uttarakhand has its own fair share when it comes to monsoon travel. Housed beautifully atop a hill, this hill station is fancied by millions of monsoon lovers in the country during the rains. Mussoorie is a natural paradise. As the monsoon arrives, the streets look more alive. The wet streets surrounded by nature float like a jazz musical movie - always on beat. The beautiful vistas, the rolling verdant hills and the cafe nooks become too alluring. It's one thing to watch the rain from your city apartment, and another thing to watch the showers as they wash out massive landscapes from top of a hill. The beautiful town breathes a new life into the surrounding. Everything looks fresh - gleaming trees, washed out roads, glinting leaves, etc. The entire land turns into a mini paradise. And if that's not it, you'll see cafes opening their doors to passers-by for a quick hot snack and hot chocolate. The famous bakeries of Mussoorie always have a freshly baked slice of cake for you as you watch the rain beautify everything around you. How To Reach Via Air: Jolly Grant Airport in Dehradun is the nearest airport to Mussoorie. Direct flights from Delhi and Mumbai are available. How To Reach Via Road: Connectivity via road is pretty active. You can find a number of state government and private buses shuttling in and out of Mussoorie. The roads connect Mussoorie with nearby places like Delhi, Dehradun, etc. Buses for Mussoorie are available on a daily basis. How To Reach Via Rail: Dehradun railway station is the nearest railway station to Mussoorie. It is located around 36 km away. There are a number of trains available from Delhi, Kolkata, Jammu and Amritsar, etc. It is surprising to see this untainted and unscathed hill station still enjoying the beauty of seclusion. Away from commercialisation and the hustle-bustle of the tourists, Lansdowne - the former army camp - boasts about its supremely clean landscapes and well-kept public area. Although Lansdowne has enjoyed its fair share of popularity during colonial times, over the years, the place has become more secluded which helped it to become one of the most beautiful hill stations in North India. During the monsoons, the place lights up and offers a panoramic view of the mega hills. If you fancy photography, Lansdowne will give you some great pictures to build your hobby portfolio. How To Reach Via Air: Since it is positioned at an elevation of 1700 m, the connectivity via air is poor. The closest airport is Jolly Grant Airport in Dehradun. You can drive from Dehradun to Lansdowne or hire a taxi which will take about 4-5 hours and covers a distance of 158 km. How To Reach Via Road: Roads have the most active connectivity due to the elevation of the place. It is 250 km away from Delhi. Most people prefer driving to the place since the journey is beautiful. There are public as well as private buses available with a good frequency. Road travel from Kotdwar to Lansdowne is quite scenic and beautiful. How To Reach Via Rail: The nearest railway station is Kotdwara railway station, which is situated at a distance of 41 km. Again, the frequency of the trains is not good so it is advisable to leave this option. This option is again not favourable if you are short of time as the rail journey takes more time. This little place is known as the Switzerland of India. It is housed in the beautiful region of Kumaon in Uttarakhand. The place offers a panoramic view of the mighty Himalayas. Pine forests are the most attractive part of this area. Especially during monsoon season, the place becomes more lively and chirpy. You'll discover a variety of flora and fauna. The place is a major attraction during monsoons as it has a variety of offerings when it comes to nature - the beautiful landscapes, diverse wildlife and pine forests. You'll never see something so beautifully kept and alive during the rains as Almora in Uttarakhand. How To Reach Via Air: Because of its height, Almora doesn't have an airport of its own. The closest airport is the Jolly Grant Airport in Dehradun which is 173 km away. How To Reach Via Road: The connectivity via roads is super active. There are frequent buses daily shuttling back and forth between the major cities. You can hop on a bus from Delhi or from Dehradun. You can also hire a taxi service from Delhi or Dehradun or drive your own car. How To Reach Via Rail: The closest railway station is Kathgodam which is about 38 km from Almora. There are regular trains from other towns to Kathgodam. Blooming in the region of the giant Himalayas, Valley of Flowers is fancied by biologists, zoologists, nature lovers and, most importantly, monsoon lovers. It is spread across an area of 87 km, offering a wide range of beautiful flowers and trees. It is probably the most beautiful place in North India. During monsoons, the area is lively and you'll see a variety of flowers blooming and just being happy. The rains wash away the dusted landscape and breathe life into the valley. This time, you will come across the most beautiful species of flowers. 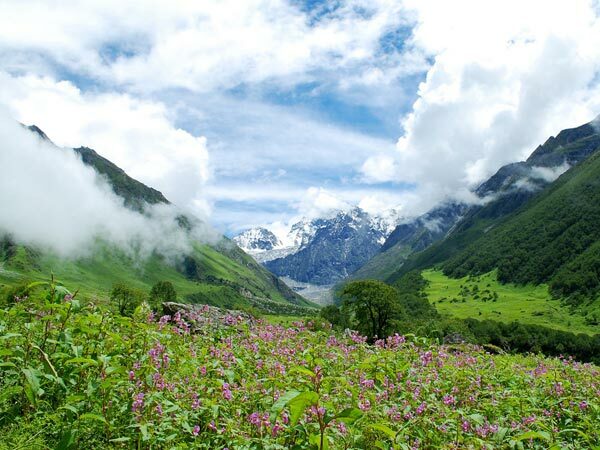 Valley of Flowers is certainly an experience that you cannot shake off. How To Reach Via Air: The nearest airport is Jolly Grant Airport in Dehradun. You can catch a flight to Dehradun from the metros like Mumbai and Delhi and then drive from Dehradun to Valley of Flowers. It is about 295 km away from the airport. You can also opt for a helicopter service. How To Reach Via Road: The nearest railway station is in Rishikesh, which is at a distance of 273 km. Trains to Rishikesh are frequent. How To Reach Via Rail: The most convenient way to reach the Valley of Flowers is via road. The roads only connect up to Govindghat and after that, you'll have to trek. It is also connected to Pulna village. You can also take a taxi service or drive down with your own car from Delhi or Dehradun.